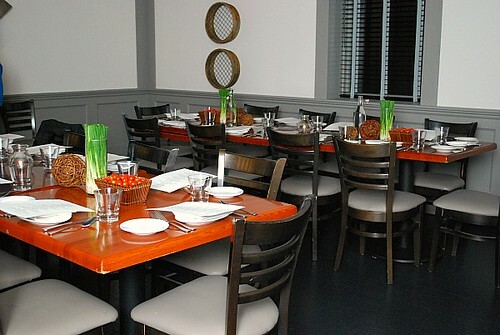 The Acre restaurant is new to the Andersonville neighborhood and highlights local, sustainable cuisine. It was a great venue for Moon Mountain's Vodka dinner since Moon Mountain is USDA Certified organic and also a local spirit. Gerry Web, the master distiller, comes from Plainfield, IL so it was great to hear his story and how Moon Mountain Vodka came to be. 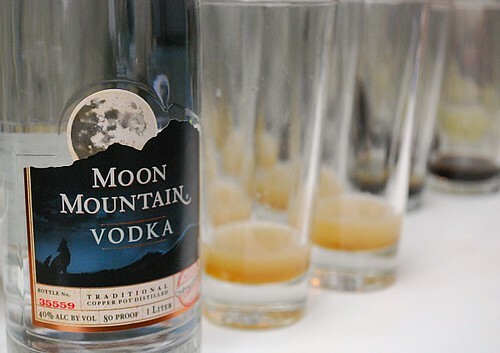 Moon Mountain Artisanal Vodka is crafted from fine organic grain and purified water to arrive at a high standard of vodka. In fact, Gerry Webb (our Master Distiller) directs the crafting of each smallyuyuu batch with the attention and patience of an artisan. Using time-honored, small-batch copper pot distillation, and modern, state-of-the-art filtration – he is able to achieve this extraordinary vodka of exceptional smoothness and purity. In fact, we feel so strongly about the character of Moon Mountain Vodka that we put an individual number and Gerry's signature on each and every bottle. 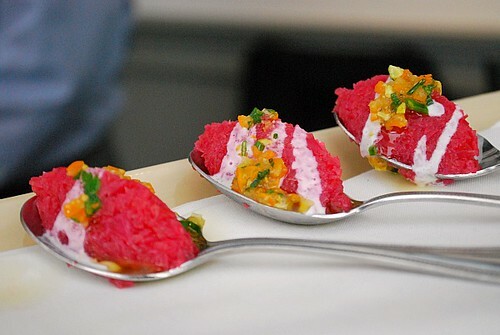 The evening started with a colorful and fruity cocktail called a Squinty Cobbler. 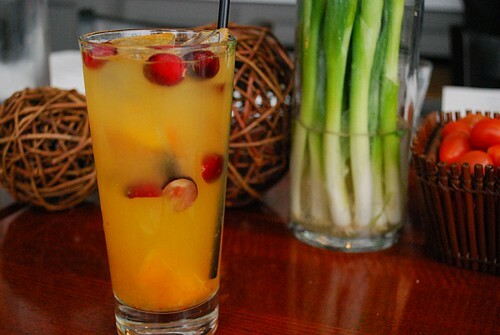 This drink involves muddled honey tangerines, fresh cranberries, and Moon Mountain Vodka, sweetened with simple syrup, topped off with club soda and garnished with flamed cinnamon. It was refreshing and a great way to kick off the night! 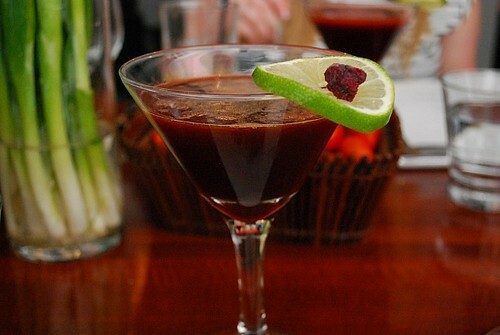 With the Arugula Salad, we also enjoyed this cocktail, a Moon Bramble. 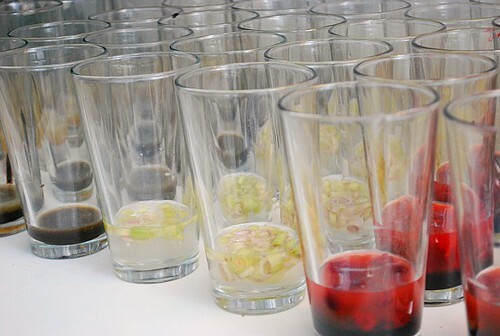 This cocktail combines fresh raspberries, simple syrup, pink grapefruit juice, and Moon Mountain Vodka with a Frambroise Lambic beer and fresh lime and raspberry garnish. Delish! The next course was an amazing Kuri Squash and Coconut Soup. Hands down, this was my favorite course. 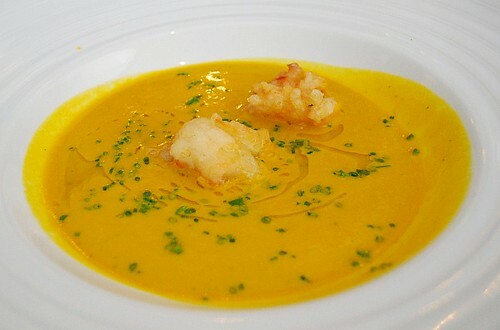 The soup was colorful, rich and topped with tempura lobster, fresh chives and drizzled with a bit of truffle oil. Our mixologist took the coconut notes of the soup and paired a Luna et Coco Cocktail with this course. The cocktail took fresh lemongrass, coconut water, coconut cream, maraschino liqueur with Moon Mountain Vodka and garnished with fresh microplaned ginger root. It was such a creative concoction and went well with the soup. 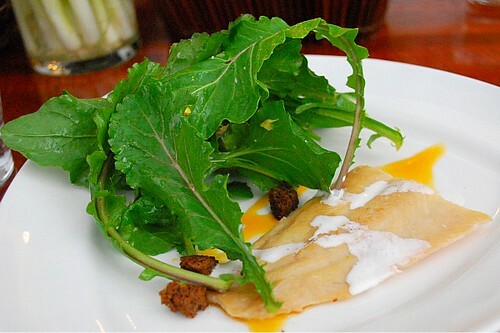 With the salad and soup course finished, we delved into this Crispy Pork Belly Confit. 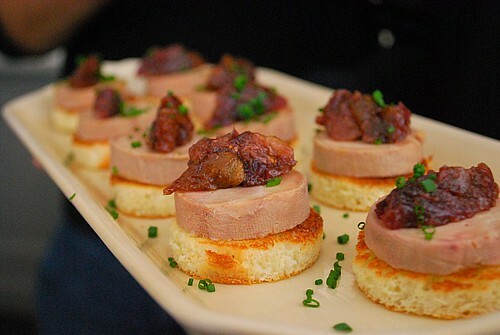 I previously mentioned how I love pork so I was really excited about this course. 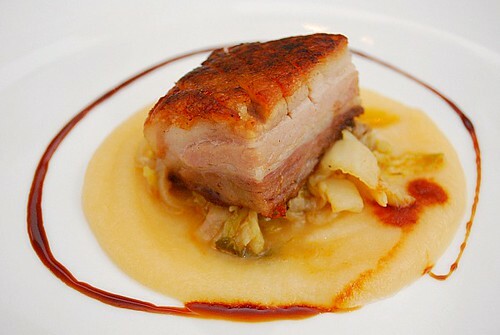 The pork belly was accompanied by smoked pork sausage, sauteed cabbage and was set atop an apple and quince puree. Because the Crispy Pork Belly Confit was a rich dish, it needed a cocktail to balance it out and with that, we enjoyed this Spiced Mountain Mule. 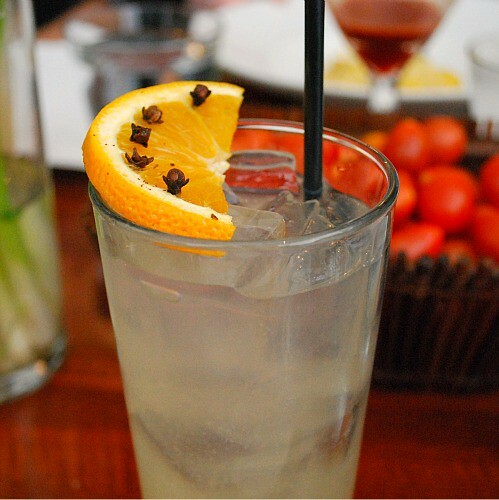 The cocktail took house made clove and allspice syrup, fresh orange and lime juice, ginger beer and Moon Mountain Vodka. 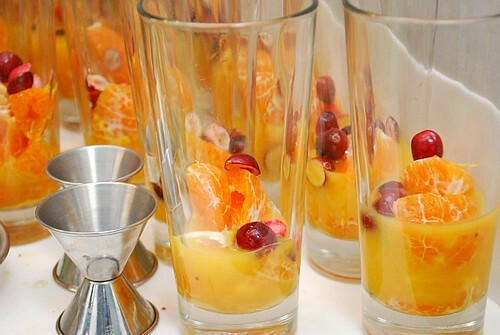 The drink was garnished with a fresh orange slice studded with whole cloves. 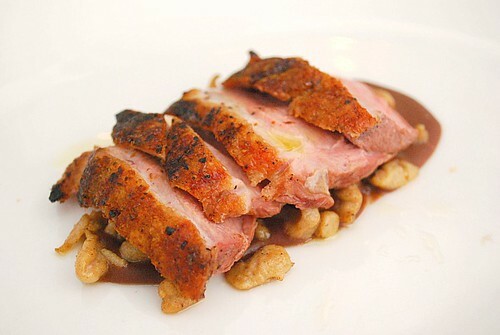 The main course of our paired dinner was this Hickory Roasted Duck, which was nestled on brown butter spaetzle and a spicy chocolate chestnut garnish. The chocolate chestnut garnish was intriguing and it really went so well together. I was really excited about the cocktail that paired with the Hickory Roasted Duck. Our mixologist prepared a Smoked Mallard. 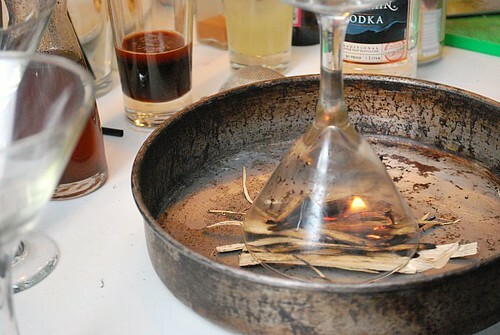 The preparation of the drink was very cool in that hickory wood was smoked in a pan and the smoke was captured in the smoked trappist glass used to serve the cocktail. As a result, the cocktail had a smoky, woodsy, savory aroma yet the drink itself was sweet. 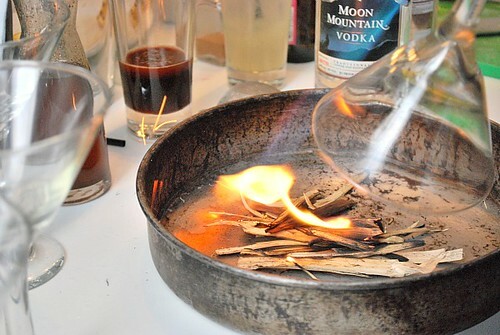 Although the glass was infused with the smoke, it only adds an aroma and no flavor to the drink. 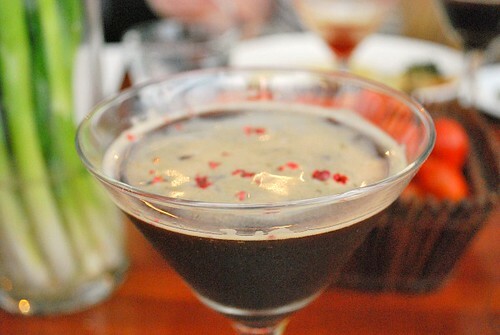 To make the drink, a combination of tamarind syrup, fresh lemon juice and Moon Mountain Vodka was garnished with hickory roasted black mission fig puree and cracked pink peppercorns. This was my favorite cocktail of the night because of the clever way it was prepared and the interesting flavor it had. 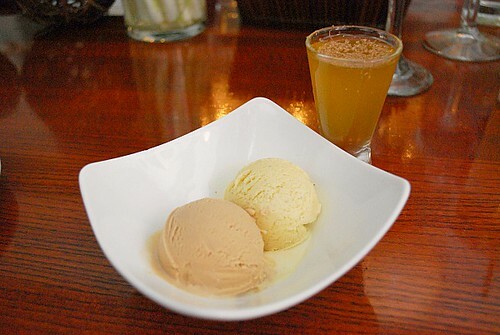 So we're at the end of our paired dinner and on a sweet note, we had Molasses and Butter Rum Ice Cream with a dessert shot made with Moon Mountain Vodka. 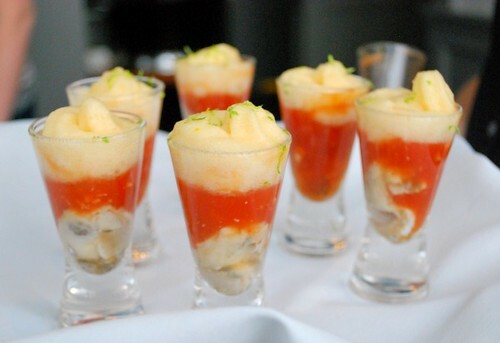 I didn't catch the name of the shot or how it was prepared but it certainly was delicious! 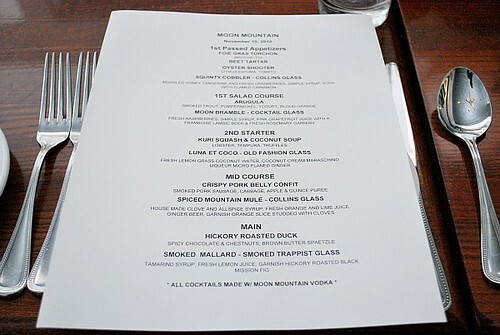 Overall, it was a fantastic dinner to highlight the fall flavors with local, sustainable fare and the many creative cocktails made with Moon Mountain Vodka. 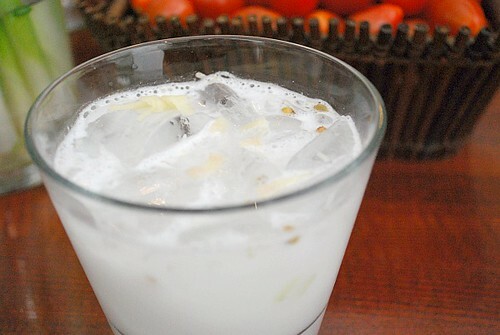 This vodka will be hitting the shelves in about two weeks, just in time for the holidays. 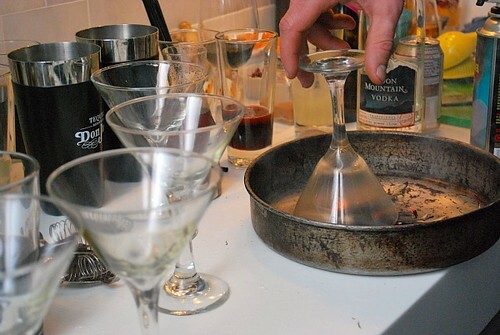 So be on the lookout for Moon Mountain Vodka and hopefully the cocktails we enjoyed will inspire you to create some delicious drinks for the holiday season and throughout the year! A special thanks goes out to master distiller, Gerry Webb and Dan DeVece for a wonderful evening and opportunity to learn more about Moon Mountain Vodka! Fabulous pictures. 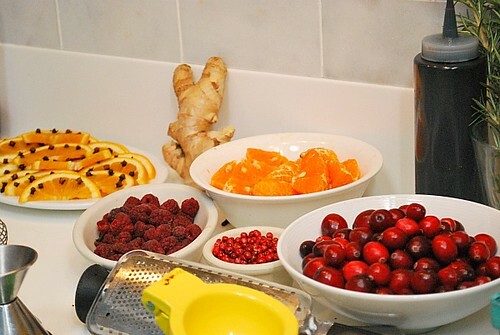 It seems you had an amazing tasting. My goodness! I wish I was there to have all those cocktails:-)!! Very inspiring too. Thnaks for this great review!